Soup fights hunger because it’s filling and low in calories. This is the perfect summer/spring soup made in a blender. Fresh and light, gazpacho can be packed for lunch in a thermos, for an impromptu picnic or even for a day on the beach. Add cooked shrimp to round it out for a fast, late-night dinner when you don’t have time to cook. Combine all ingredients for the gazpacho in a blender or food processor. Blend until smooth and refrigerate until serving. For the optional add-in, sprinkle shrimp with salt and pepper. Coat a large skillet with cooking spray and heat over high heat or heat a grill over high. Cook shrimp 3-4 minutes per side until no longer translucent in the center. 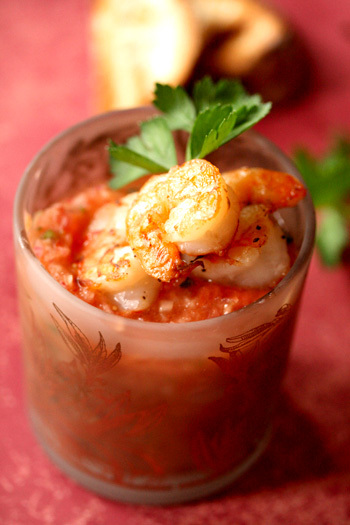 Top gazpacho with shrimp and cilantro, serve immediately. Nutritional Information Per Serving (2 cups gazpacho with 1/4 cup shrimp): 170 calories, 11 g protein, 14 g carbohydrates, 8g fat (0 g saturated), 71 s mg cholesterol, 3 g fiber, 625 mg sodium. Make It A Meal: The recipe featured above goes nicely with Stuffed Mushrooms and Cherry Peppers.